Miso Crafty Knits: Long Weekend! This past weekend was a long one for us Canadians, as it was the Victoria Day May long weekend. It was also Brett's birthday. It was a pretty low-key weekend in general, and a lot of it was spent either outside or suffering from the pounding headaches we got from having to (involuntarily) listen to all the high school marching bands that were participating in this year's parade practice in the parking lot that is literally steps away from our front door. Although, it was kinda cool to hear a marching band do their rendition of Lady Gaga's Bad Romance (and not so cool to hear the Canadian national anthem being played off key and a bit butchered...but I guess it was a good effort for a group of kids that aren't even from this country). We lucked out and the weather was absolutely gorgeous! So gorgeous that if it were up to the Munchkin I don't think he would have ever come back inside the house! I also did some cookie baking, of both the basic chocolate chip and of the unusual varieties. We also ate birthday ice cream cake. And a lot of it. The photo above is what Brett's birthday cake looked like before we dove right in. No, I didn't make it. No, I didn't pick out the design. This was all Brett's doing. He's an odd one. Odd as fish. We love Dairy Queen ice cream cakes and are always looking for an opportunity to get one. So when deciding on what kind of birthday cake we should have it was so beyond obvious what that choice was going to be. I didn't think about the cake decorations at all, I was more about the cake. So I left it up to Brett to choose what he wanted, it was his birthday after all. There's no meaning behind this cake, aside from the fact that Brett thought that the squirrel was pretty funny looking. 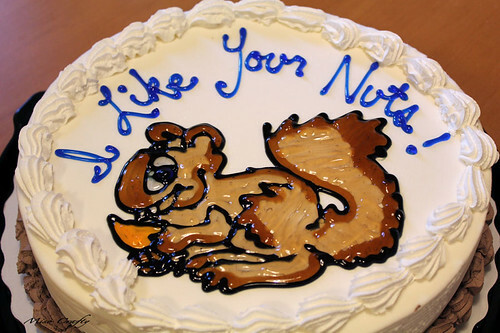 Then when asked if he wanted anything written on the cake, he got the brilliant idea of "I like your nuts". Again, there's no meaning or story behind this (I would've chosen "Happy Birthday" or something like that, but I guess I'm boring), Brett just thought it was pretty darn hilarious. I'm just glad that the cake was pretty darn yummy.